The Colorado Plateau is a geologic uplift located in the four corners area of the American Southwest. It is a high desert environment flowing over the southern third of the state of Utah, spilling into the northern quarter of Arizona, and reaching into a slice of southwest Colorado, and a sliver of northwest New Mexico. Composed of 130,000 square miles, the Plateau rises to an average elevation of 6000 feet above sea level. There are mountains, ancient remnants of volcanoes really, which sit often snowcapped at over 12,000 feet above sea level, and canyons carved through rock by flowing water cut as deep as 2,000 feet above sea level. With changes of elevation come associated changes in localized climates, and flora and fauna. Hence the Plateau, with its dramatic contrasts in elevation, contains a great deal of diversity. Home to a great concentration of national parks – some of the most magnificent in the park system, in fact – as well as Native American culture and art, the Plateau also sports the traditional decades old scene of ranching, grazing, mining, and mineral extraction. With few paved roads, a topography jumbled by canyon systems and meandering rivers and their tributaries making navigation difficult, variation in altitude and microclimate, and the legalities surrounding Native American tribal lands, the Colorado Plateau region remains, in many ways, the epitome the Wild West: a landscape full of struggle and beauty. The view from Courthouse Towers as seen from the bottom of the second rappel in U-Turn Canyon, Arches National Park. Long before the uplift which formed the current day Colorado Plateau, geologists tell us, ancient seas advanced and retreated over much of the region depositing calcium and sand which would become limestone and sandstone over the course of geologic time. Indeed, it is this sedimentary rock which now dominates the area. In most cases it is naked rock; exposed as cliffs and hoodoos, alcoves and spires, toadstools and towers, varied in hue, but always colorful, and when the sun rises or sets, the land of naked stone puts on a stunning show. Canyons are carved through these soft sedimentary rocks by the flow of water. Sometimes gentle, sometimes violent and raging, water follows the path of least resistance in the desert, often funneling into hairline cracks in the rock and over time expanding them into nature’s works of art. Slot canyons, as these narrow defiles are known, abound on the Colorado Plateau. There are hundreds of named canyons, and likely thousands of canyons unnamed, many yet undiscovered. Slots are beautiful, and sometimes haunting, subterranean worlds. Composed of narrow hallways, lofty walls often polished smooth by the flow of water, pothole filled pools, lush grottos, hanging gardens and waterfalls, and home in many cases to endemic creatures or plants, the slot canyons of the Colorado Plateau are as varied as the Plateau itself. Some slots offer up their beauty for a relatively low price of admission – mainly walking through them on sandy, uneven terrain with a possible scramble here or there to spice things up. Other slots, however, have more obstacles guarding their goodies. The more obstacles, usually the harder the canyon is to descend. Often water falls, down climbs, cliffs, potholes, silos, and sketchy footing require rope and specialized tools to defeat. If a canyon can be hiked without any necessary equipment, it’s considered a non-technical canyon. When obstacles are required to be overcome with the use of rope, rock climbing tools, and gear, the canyon is called technical. To assist canyoneers - individuals who descend canyons – in assessing the overall difficulty of a canyon, a rating system has been developed. The system, based loosely on the Yosemite Decimal System used for decades by rock climbers, attempts to provide one with the approximate time commitment for a given canyon under normal conditions, the degree of rope work necessary, any special hazards, and whether its likely to be dry, wet but free of current, or wet and flowing. All of these considerations are taken into account when planning to descend a canyon, and for purposes of outfitting one’s self and the group with appropriate clothing and equipment. Sculpted by water, wind, and time itself, slot canyons are often breathtaking micro environments in an arid landscape. As sacred and sublime as a basilica or tabernacle, slot canyons of the Colorado Plateau are nature’s cathedrals in the desert. Canyoneers divide up the Plateau into several distinct areas for ease of differentiation of canyons. Each area offers up its own, unique, challenges and aesthetics. Utah, which is home to the lions share of the Plateau, has seven distinct canyoneering regions. For example, the North Wash region of Utah is known for skinny slots requiring multiple rappels, negotiating narrow hallways, and performing a number of down climbs. With canyons suitable for beginners through expert, there is plenty to keep a canyoneer busy for weeks at a time here. 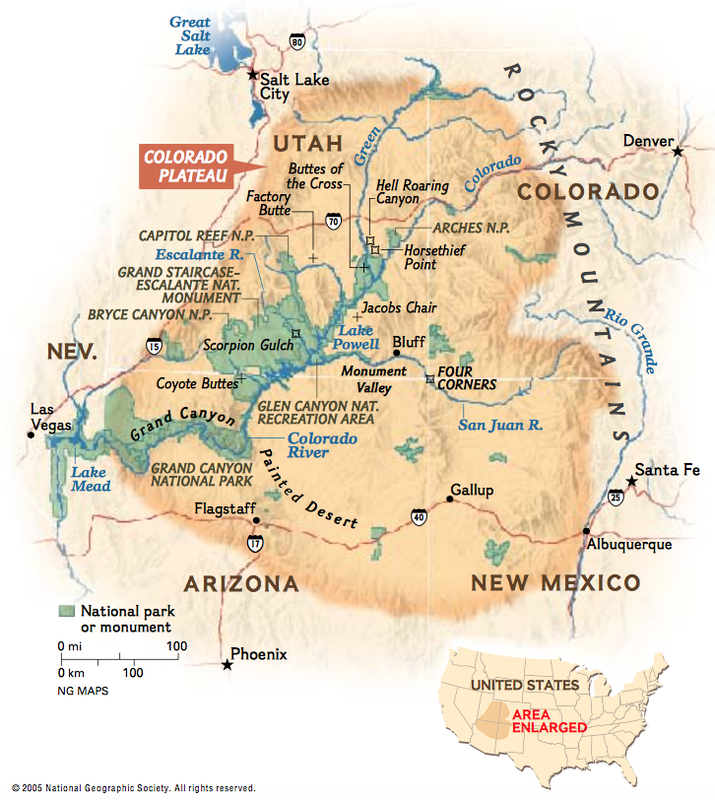 South of this area, Lake Powell is a different story altogether. In this region the slots are difficult to access, often requiring a boat. Canyons themselves are longer and typically more difficult than other areas in the state. And because these canyons see far less visitation, there is a distinctly primitive wilderness feel to the Lake Powell canyons. East of Powell one will find Cedar Mesa, home to many fine classic canyons. Often physical and wet, these are challenging canyons featuring shorter rappels, swimming through cold pools, and negotiating challenging terrain. In the northeastern section of the Plateau around the town of Moab is another region where canyoneers head to descend canyons. The landscapes around Moab are dramatic, but the canyons themselves are rather mellow affairs of several rappels and easy navigation. Usually dry, and with short approach hikes and exits, the canyons around Moab are generally mild excursions of a few hours each. Carol Mattera dropping into a series of emerald colored potholes deep in a Colorado Plateau canyon. The San Rafael Swell, however, is anything but mellow. This canyon-riddled uplift of limestone about 40 miles wide is west of Moab, and runs for about 70 miles southbound, with its lower stretches protected as Capitol Reef National Park. Canyons in the Swell are punctuated by keeper potholes. Keepers are deep depressions in the soft rock floor of a canyon into which water flows in wet conditions. In such conditions, keeper potholes are not difficult to exit from – a canyoneer simply gets in the pool, swims across, and exits. Imagine, however, in drier conditions, when climbing out of the pool – with its walls over your head - becomes impossible without specialized tools and skills. A pothole is in keeper mode when such a scenario presents itself. Individuals have perished by miscalculating keeper potholes. Robbers Roost, another canyoneering location on the Plateau in Utah, is so named because Butch Cassidy, the Sundance Kid, and their colleagues often spent time hiding out from the law in this canyon strewn, nearly impossible to negotiate landscape. Canyons here are long, narrow, mainly dry, and definitely technical. Those unaccustomed to canyons but aware of Hollywood may have seen the movie 127 Hours. The setting for the movie was here, in the Roost. It highlights the true life story of canyoneer Aaron Ralston who, while soloing Bluejohn Canyon, became entrapped when a boulder shifted and pinched against his arm pinning him to the canyon wall. Ralston, who was unable to free his arm despite several days’ attempts, ultimately cut it off altogether with a dulled multi-tool blade, and hiked out to safety. Dramatic and highly unusual, the Ralston story is the type of drama from which Hollywood is made. The Escalante region, located on the southwestern edge of the Colorado Plateau, is home to the hamlet of Escalante, Utah and the surrounding 1.9 million acres is wilderness preserved as the Grand Staircase-Escalante National Monument, a rolling desert badlands of canyon cut terrain, water scoured slots and few roads, all of them rough to impassible under various conditions. The difficulty accessing Escalante's technical slot canyons thins the crowd, but for those who brave the difficult inroads and steep, rough approach hikes in and out, slot canyons in the Escalante are hauntingly beautiful, and infinitely lonely. Mostly hard, committing canyons for experts, the Escalante also offers a few non technical gems. It's a canyoneering wonderland, and getting to it is a large part of the adventure. Zion National Park is the last of the eight well known canyoneering areas on the Utah section of the Colorado Plateau. This is ground zero for the sport of canyoneering in the United States. Zion’s canyons are lush and deep, wet and cold, classic and challenging. Best suited for descents in summer and fall, these canyons may be completed at other times of the year with heavy wetsuits or dry suits. Zion’s technical canyons draw canyoneers from around the globe. They are world class in exquisite beauty and in technical challenge. On the Plateau in Arizona, the Grand Canyon is a hot spot for canyoneering. Technical canyoneering is still relatively new to the park due to the extremely difficult terrain and the unforgiving nature of Grand Canyon’s precipitous topography. Canyoneers are, however, getting in there and completing technical routes into hidden slots and narrows. While the canyon has been a prime hiking destination for American and international visitors for generations, only lately have we found increasing numbers of technical canyoneers applying for permits to explore slots. The Grand Canyon is not one canyon as its name would imply. Rather its one river gorge with countless drainages cut from both rims down into the main channel. In essence the Grand Canyon is a canyon composed of many hundreds of smaller canyons. New discoveries are available to motivated, fit, seasoned canyoneers in this grand daddy of all canyon systems. Plateau canyons in Colorado carve out of the southwestern mountain ranges, up near Telluride and Ouray, and down near Durango. Also, on the Colorado and Utah line sits Colorado National Monument, a tangle of canyons and mesas waiting to be descended and ascended - some are popular routes, and others remain seldom seen. The Colorado Plateau in New Mexico cuts across the northwest corner of the state. Mainly Navajo Nation land, much of the area is inaccessible to backcountry visitation. Nearby, on the Colorado and New Mexico line, sites such as Mesa Verde National Park, as well as the Ute Mountain Tribal Park and Chaco Canyon Archaeological Park, are each located in dramatic canyon settings. Archaeology of the 1000 plus year old pre puebloan culture (sometimes know as the Anasazi) is the real attraction in these parts. Folks looking to canyoneer usually go elsewhere, while those interested in the pre history of the Colorado Plateau could spend a life time in this lonely, remote corner of the state. This ancient ruin, in the Wupatki National Monument near Flagstaff, Arizona, was likely constructed nearly 1300 years ago. The fingerprints of the ancient masons can be seen in the mortared seams between the carefully laid stones. In 1869, Civil War Major John Wesley Powell, who had lost one arm at the battle of Shiloh, led a rag tag group of explorers and mountain men on an expedition down the canyons of the Green and Colorado rivers, and through Grand Canyon. His was the first party to penetrate and systematically explore the last unknown region of the contiguous United States. The best maps of the day simply had the word “Unexplored” printed across what we now refer to as the Colorado Plateau. The tangle of canyons and cliffs and rivers impeded rapid penetration into the region before and after Powell’s two expeditions (he came back and completed the route a second time, two years later). To this day, thankfully, the Plateau is mostly an undeveloped, lonely, wild, canyon badlands framed by blue sky. Things looked threatening on the Plateau in the late 1940s and early 1950s, as the Cold War came to the hot desert. The atomic age found prospectors staking claims across the region in effort to make their fortune selling uranium to the government for its nuclear program. Most of the claims turned up nothing, or very little, and the demand for the product quickly waned. Soon after uranium mining boomed, it busted, leaving in its wake some very rough, unpaved and unmaintained roads prospectors had cut to reach their claims. Canyoneers sometimes use these paths as approach hikes into, or exit hikes out from, slot canyons. In most cases all that remains of these old roads are the faintest of tracks. In time they will fully disappear as nature reclaims its own. In the late 1950s and 1960’s, about a thousand miles to the southwest in California’s Yosemite Valley rock climbing had taken off, attracting many young climbers who would shape the nature of rock climbing for decades to come. Names such as Royal Robbins and Yvon Chouinard are legendary in the sport, the former setting standards for technique and the latter setting standards for equipment, each of which ring true a half century later. These standards would be used during the early years of the exploration of technical canyons on the Colorado Plateau, until more canyon specific techniques and gear emerged and set a new standard for the sport of canyoneering. Antelope Canyon, a narrow slot on the Navajo Reservation in northern Arizona. Royce Trapier was an early visitor to the Colorado Plateau’s canyons. In the late 1960s or early 1970’s, Trapier descended a number of technical canyons in and around Zion National Park. Little is known about Trapier, but evidence of his descents can still be found in some remote locales in the region. In the mid to late 1970’s Dennis Turville found his way from a rock climbing background to the canyon-lands of the Colorado Plateau. Turville completed first descents of many of Zion’s classic canyons, as well as many canyons across the Plateau. Like Trapier before him, Turville found the slot canyons of the Plateau to be magical, spiritual places, and felt no desire to share them with the masses. Consequently, neither adventurer shared information about canyons, known as “beta” in climbing and canyon lingo, with anyone other than close friends. Canyoneering on the Colorado Plateau right up through the 1970’s, even in a place such as Zion which would become ground zero for the sport, was not a mainstream endeavor, and information about where to go was scarce. Throughout the 1980’s there began to emerge guidebooks. Not so much to technical canyons – those would show up a decade or more later – but guides to hiking non-technical canyons on the Colorado Plateau. Prior to this point there were always guide books to easily visited canyons and super classic canyons, but through the work of hiker/writers such as George Steck, Steve Allen, and Mike Kelsey the beta for a tremendous number of non technical hikes, many quite remote and dangerous, became available to the general public. Of the three, Mike Kelsey branched out in the early 1990’s and published a book of technical canyoneering routes on the Plateau. Kelsey’s publication nudged open the door. In the twenty five years which followed a small handful of guide books to canyoneering on the Colorado Plateau have emerged. Throughout the 1990‘s and into the present, canyoneering on the Colorado Plateau has garnered additional devotees. Pioneers such as Jenny West, Steve Ramras, and Tom Jones have improved canyon specific techniques, shared beta, increased safety, and provided awareness and a voice for canyon access. Tom Jones, a former engineer of rock climbing hardware for Black Diamond, now owns his own company, Imlay Canyon Gear specializing in Colorado Plateau specific canyon ropes, hardware, and soft gear. Jones’s Imlay products set the bar high and have been producing small batches of high quality equipment for about ten years. Other small, Plateau-specific canyoneering gear crafters have emerged in the last couple of years. Similar to Yvon Chouinard in the 50‘s hammering out his own top quality pitons with a hammer and anvil for sale from the back of his station wagon, today’s canyon specific companies are based on the concept of simplicity and efficiency coupled with safety. While numbers engaged in the sport are growing, canyoneering remains a relatively obscure endeavor – and when viewed within the scope of the size and diverse nature of the Colorado Plateau, canyoneers pretty much have the canyons to themselves. You are on your own, far removed from the roads, farther still from even a one horse town, and a full day’s drive away from any major city. Some of the "tools of the trade" of canyoneering, getting ready for use. The gear one carries in one’s backpack on a canyoneering trip depends on many factors. Typically, the rating of the canyon will indicate the time commitment, difficulty of rope work, and also note any unusual obstacles requiring specialized equipment. These ratings are to be taken loosely, however, and a seasoned canyoneer understands judgement and experience goes a long way during the decision making process of navigating the obstacle course that is a typical slot canyon. Canyoneering gear is a hybrid in many ways between rock climbing and caving gear. Generally speaking a canyoneer will carry rope, and back up rope, of enough length to descend the highest rappel in the canyon; a harness is worn and a locking carabiner connects it to a rappelling device through which the rope travels--when the rappeller wishes to slow down he or she easily increases the friction of the device on the rope, and equally as easily decreases the friction on the rope if wanting to speed up the descent; a helmet is worn to protect one’s head from falling objects such as rocks or your partner’s camera; various anchoring materials are carried to create anchors for rappels; and specialized tools are carried for specialized situations such as crossing keeper potholes, or descending big walls greater than one rope length in height (typically 200 feet), or descending expeditionary canyons where the canyoneer does not know what to expect on the descent. Canyon specific gear and improved canyon specific techniques have increased safety and decreased the impact canyoneers have on the delicate environments they so well love. The ethic is always, above all else, leave no trace. Canyons exist on every continent except Antarctica. They are cut into the Dolomites of Italy, flow out of the high peaks of the Himalaya, criss cross the Blue Mountains in the outback of Australia, are incised into the great Kilimanjaro, and drop jungle-clad and waterfall-drenched out of the Andes. Most everywhere around the world the sport is referred to as canyoning, except in parts of Africa where it is known as kloofing. Canyoneering is a uniquely American term in use virtually nowhere else in the world, but firmly entrenched in the vernacular of the Colorado Plateau. Wherever there are mountains and deserts there are canyons; drainages for spring runoff, paths of least resistance. The most run of the mill canyons contain beauty, and the special ones are outright magical. Due to the combination of beautiful, swirling red rock, the diversity of canyon options, an average of 300 days of sunshine annually, and raw primal beauty, coupled with more canyons than a rabid canyoneer could do in a lifetime in all located in a rather compact location, canyons of the Colorado Plateau are sought after by canyon enthusiasts from across the globe, and stand as some of the most magnificent landscapes on the face of the earth. The iconic Monument Valley at dawn. With the advent of the internet canyon enthusiasts have been able to connect and communicate. The result of this has been an increase in the overall canyoneering community. Numbers remain small, but interest does continue to grow. A free flow of beta exists in the online world and some formerly obscure canyons few knew about have become relatively mainstream. In many national parks on the Plateau permits are issued for those interested in descending technical canyons. Some parks such as Zion charge a fee, others like Arches do not. All parks strive to keep tracK of the numbers of canyoneers and the traffic on known canyoneering routes. As more participants to the sport descend the canyons it will continue to be of utmost importance for each individual to practice good stewardship of the canyons. Towards this goal new techniques aiming to leave no trace have emerged. In the earliest days of canyoneering on the Plateau descentionists would not think twice about sinking a rock climber’s expansion bolt into the delicate sandstone of a canyon wall to provide an anchor point, or for that matter hammering in a piton or two for the same purpose. Today a majority of canyoneers on the Plateau have adopted a no-new-bolt ethic - except under life and death circumstances – favoring the use of natural anchors instead. Natural anchoring involves using a natural object such as a tree or boulder, around which a length of one inch tubular nylon webbing is slung, a small stainless steel rappelling ring is attached, and the rope is threaded through the loop thus creating an anchor point for the rappel. The webbing is left behind, true, but come the next flash flood it will be washed away leaving the canyon unmarred. The concept of “ghosting” canyons has been received with great favor from the canyoneering community. The ghosting ethic maintains that one leave absolutely no trace of one’s passage, including all anchor materials. The promotion of a ghosting ethic has upped the ante of leaving no trace. While more wilderness adventurers are finding the subterranean world of slot canyons appealing to their sense of aesthetic, I am hopeful they will want to preserve what they experience, and pass it on down to those who will follow. In the spring of 2014 rangers out of Grand Canyon National Park announced they had located the body of a man who had been been the focus of an extensive search when he had first gone missing four years earlier. One lesson of this man's tragic loss is profoundly astounding: we still have wild places in our nation where it's possible to disappear. For many, knowing the Big Empty of wilderness is out there beyond the roads is reassuring. Conservationist, nature writer, philosopher, and lover of the Colorado Plateau, Edward Abbey, once wrote “we need wilderness whether we ever step foot in it or not.” Wilderness is a diminishing reality in the United States, and nowhere is more wild in the lower forty eight than the Colorado Plateau. Riddled by canyons, those labyrinths of serpentine carved stone, the Colorado Plateau is a red rock desert wilderness like no other. It deserves our collective attention and respect. Header art by T. Guzzio. Original photo - and all others shown - via the author. Christopher Mattera has been descending and photographing technical canyons on the Colorado Plateau for twenty-five years. His photography appears in Moab Canyoneering: Exploring Technical Canyons Around Moab, the newest guide book to technical canyoneering on the Colorado Plateau, recently published by Sharp End Publications. Contact Christopher Mattera, Ed.D. at chrismattera@hotmail.com.